The Blogless Wonder: Mission Completed! 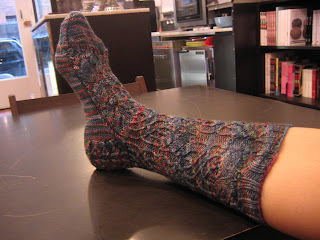 I'm sure the few people that were once reading this random blog are no longer, BUT I had to show off the finished Sockapalooza socks. Just a few days late which I blame entirely on the fact that I chose a too-difficult pattern. Which meant this was not a mindless knit. 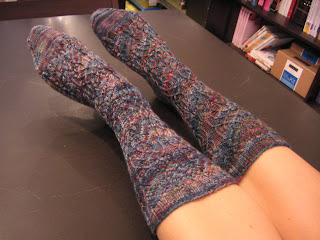 But I'm so pleased with how they turned out and now I just hope that my sockpal likes them! Photos courtesy of the Subway Knitter. That's The Point in the background. I LOVE this pattern. Though I had many nights filled with cursing of the little cables, I love how it turned out. In retrospect, though the distinct pattern would have probably had more pop with a solid color, this variegated yarn also suits my sockpal's color preferences so I'm happy with that. Not evident in these pictures (see Cookie A's pictures for a better shot), is the beautiful back of the heel. Phew. Now i just need to handle the extra challenge of making my way to the post office sometime this century. They are beautiful, your sock pal will be thrilled. 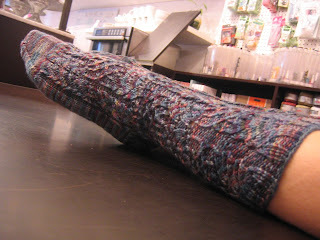 Having seen these socks in person, I can attest to their beauty. Any sock pal would be lucky to receive these treasures! I'm going to head over to Cookie's site right now to check out that pattern. Oooh, so pretty! I'm sure your pal will love them. Have you received your socks yet? Those are lovely. I wish they were for me. Knitsmiths gotta have a field trip to NYC!